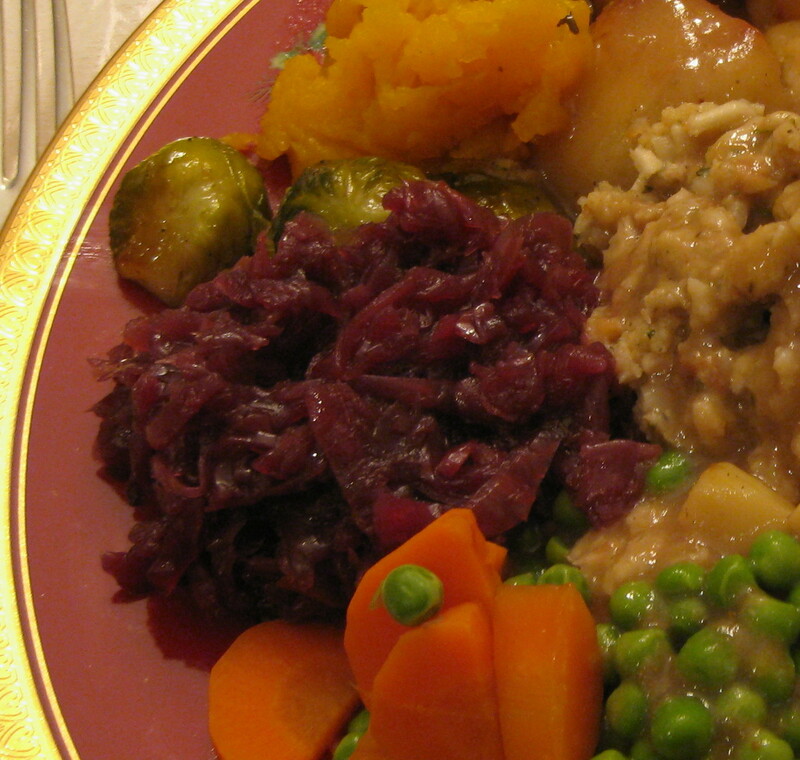 Rødkål (braised red cabbage) is a very popular dish in Denmark. 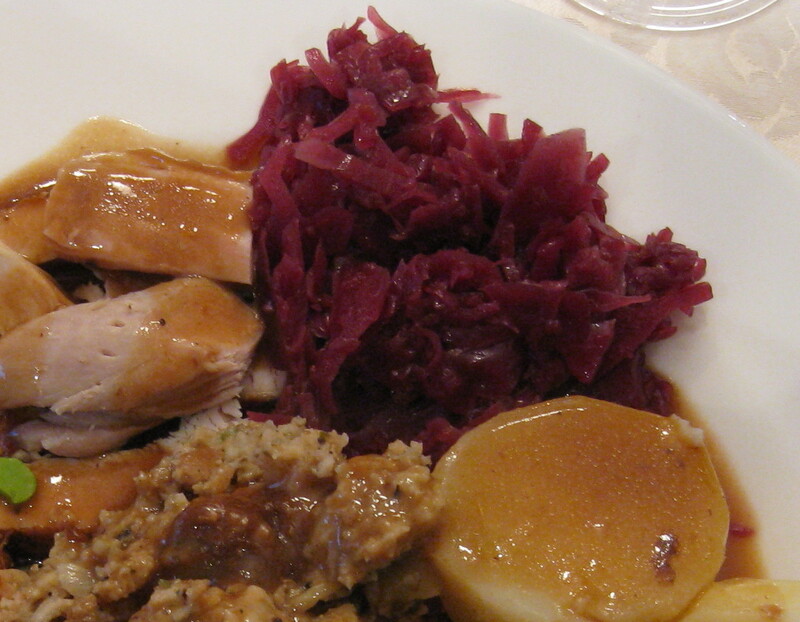 It is commonly served with roast pork, sausages, duck, goose, frikadeller or turkey. I find the dish tastes much better when it is reheated the second day. 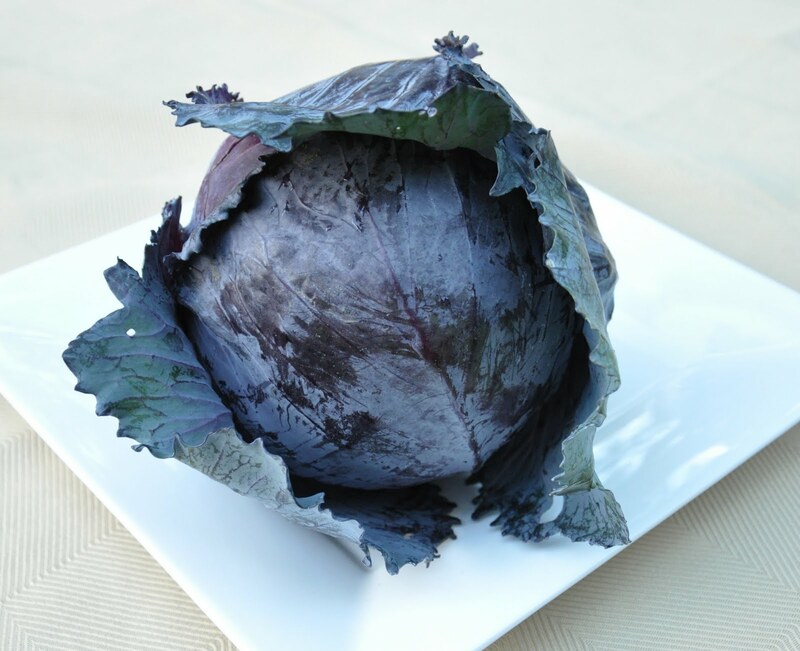 Whenever I received a red cabbage in my CSA basket this summer from Roots and Shoots Farm, I almost always made rødkål and froze it for future use. This time when I made rødkål I had two cabbages. One regular size and a wee one. So I made one and half times the recipe below. I think that rødkål is considered most authentic when it is made with red currant jelly. But plum jam works well too. We had homemade of both growing up but more often than not it was the plum jam that was plentiful. Shred cabbage. 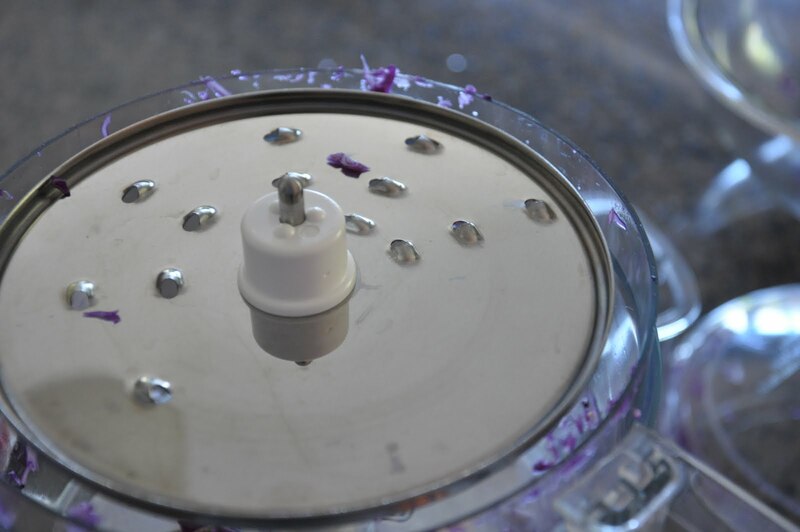 I use my KitchenAid food processor and use the straight blade of the double blade. This gives a thin cut. Melt butter with vinegar in dutch oven. 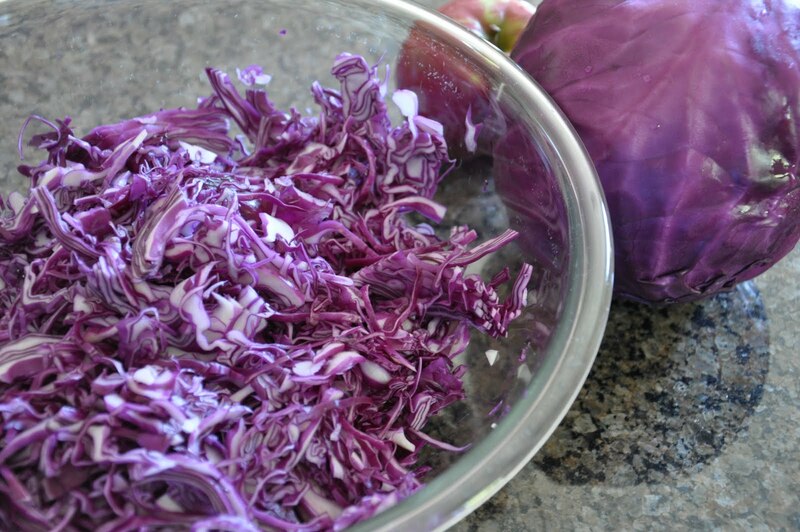 Add shredded cabbage. Lightly sprinkle salt on each layer as it is added to the pot. Skin the apple, core and quarter. 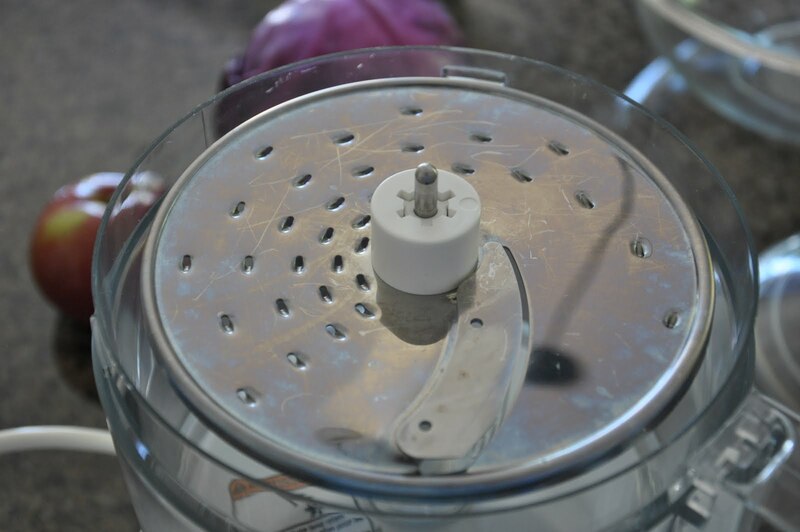 I use my large shredding blade for processing the apple. Or sometimes I just dice it. Because I tend to use the McIntosh apple, it breaks down well in the braising process no matter what its starting shape. Add plum jam and diced/shredded apple to the dutch oven. Mix with the cabbage. Keep the lid on. Make sure that the cabbage does not cook dry! Add a bit of water if you are worried about that. Cook at least for 1 hour on a very low simmer. 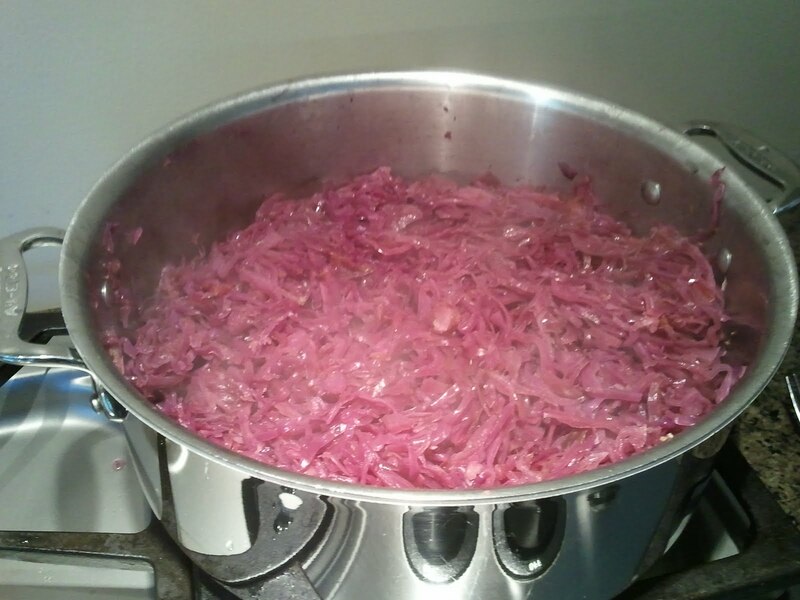 The braised cabbage freezes well. 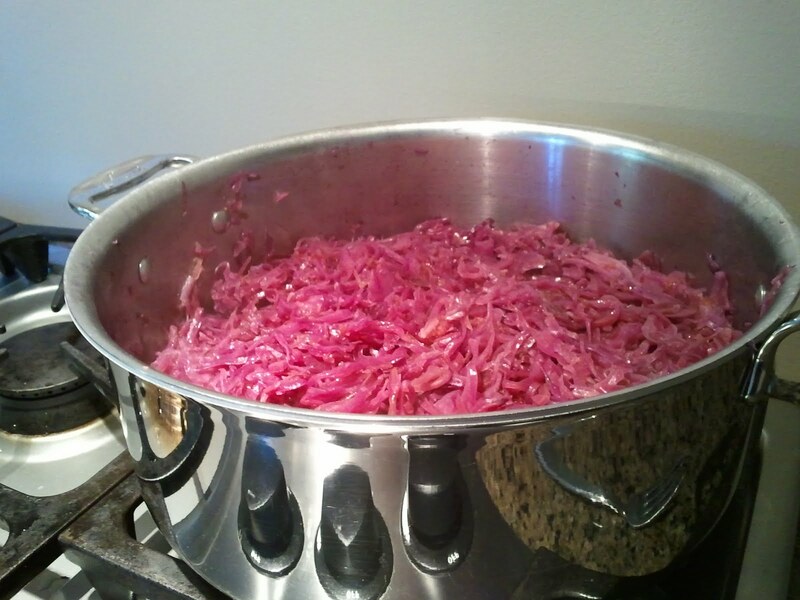 It was a way of softening up the cabbage too, which is why I love having it as a reheated dish. It just seems so much better. I freeze it in portions so I don’t have too much when I go to use it. 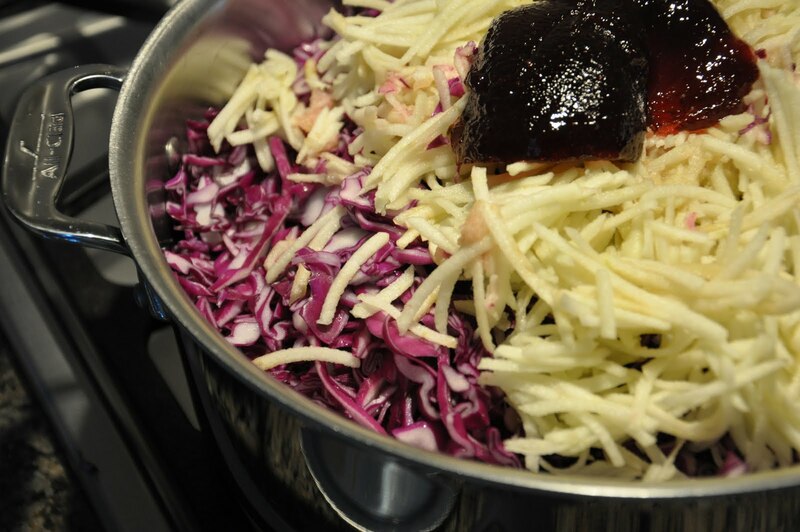 To reheat, put the thawed cabbage into a pot on a very low simmer and add a bit of plum jam or red currant jelly. Heat it through. I find the cabbage looks a bit pale when I freeze it, but when I reheat it with a bit of jam, the dark colour comes back. We ALWAYS have rødkål with turkey at Thanksgiving and Christmas.